When spring arrives in Alabama, we get that itch to get outdoors and bask in the balmy weather. While it’s nice to take a hike or go on a bike ride, why not shake things up this spring and do something unusual? Maybe take in a rattlesnake rodeo, or watch grown men in kilts fling heavy objects. Maybe you’ve been bulking up your whiskers all winter, and you’re primed to compete in a beard contest. Caber tossing, stone throws, tug of war. Aye, laddie, they are all part of the Southeast Alabama Highland Games, a.k.a. the Wiregrass Highland Games, presented by the Twisted Kilt Society of Dothan. The event is held the third weekend of March, around St. Patrick’s Day, and is designed to bring the cultures and athletics of Scotland, Ireland, and Great Britain together. Of course, there is plenty of food and drink at the festival, along with music provided by the Throwing Stones (get it? ), but the main attractions are the athletic events. The stone throw is much like shot put, but competitors use round stones that weigh between 13 and 20 pounds. The favorite is caber tossing, where each competitor tosses a 20-foot-long tree that weighs 100 to 130 pounds. The town of Greenville is your time machine back to medieval days with the Alabama Medieval Fantasy Festival, held annually the third weekend of March. Come dressed in period costumes and join the Royal Procession before being judged in the costume contest for prizes. If you have some serious whiskers, take part in the beard contest, and then get ready for real excitement with the jousting competition. Period music plays throughout the weekend by such bands as the Haggis Rampant, with their tribal drums and bagpipes. And, of course, there will be food and beverages. All of this and you may learn something, too. There are several historic demonstrations including a talk on medieval manners, historic cooking and baking, woodworking, and Viking storytelling. Admission is $10 for adults, $5 for children 5-16, and free for children under 5. In 1919, the Dixie Overland Highway, stretching from San Diego to Savannah, Ga., was nearing completion, but it lacked one key feature—a bridge spanning the Tombigbee River in Demopolis, Ala.
Frank Inge Derby, a local auctioneer, came up with a brilliant idea to help fund the project—a rooster auction. The event raised $45,000 and helped fund construction of what was dubbed Rooster Bridge. The rooster auctions eventually became an annual festival that’s now calledRooster Day. Folks from the region gather the second weekend of April in the town square to take part in 1K and 5K races, and buy local and regional arts, crafts, and pottery at the Rooster Fair, while the kids take part in the egg toss, face painting, and more. While roosters are no longer auctioned, you can bid on some great items, like weekends in condos on Alabama’s Gulf Coast beaches. Normally, people turn away as fast as they can at the sight of a rattlesnake. But, every March people flock to the town of Opp where the rattler is the center of attention at the annual Opp Rattlesnake Rodeo. The rodeo was the brainchild of J.P. Jones and the Opp Jaycees, who wanted to create a family friendly weekend event. The gathering hasn’t changed that much since it was started 58 years ago, and it includes snake shows, arts and crafts, local food booths, karaoke contests, snake races, and even an auto race, the Rattlin’ 100. There is nothing more Southern than grits, that tasty dish of ground corn meal that’s boiled and served with things like shrimp, eggs, cheese, and plenty butter. Grits is the centerpiece of the Kymulga Grits Festival in Childersburg. The festival is held the third Saturday in April and serves up not only grits but dozens of other Southern dishes including cornbread, pinto beans, and boiled peanuts. And, of course, music, arts and crafts, and lots of family fun. The Pepper Jelly Festival is about more than jelly. It was started by the Alabama Rural Heritage Foundation as the "Rural Fun Day," a time to celebrate the area’s artisans, music, and the heritage and history of west-central Alabama, better known as the Black Belt. Held the last Saturday of April at the Alabama Rural Heritage Center, the day is filled with demonstrations of lost arts, amazing food, including famous Thomaston Bar-B-Que, and of course, music. In 2005, the name was changed to the Pepper Jelly Festival to honor a time-honored, time-tested local jelly recipe, Mama Nem’s Pepper Jelly. The green and red jelly, which is great as a glaze on ham or mixed with cream cheese for a bagel spread, has become more than a regional favorite and is made by the students and staff at the center. There’s probably only one thing more Southern than grits, and that’s Poke Salat. Some call it a weed, while others call it delicious with a flavor reminiscent of asparagus when it’s cooked. In any case, Poke Salat has been celebrated the past 34 years in the town of Arab during their Polk Salat Festival. That’s not a misprint. It is "salat," not “salad,” although most people agree that the word has, pardon the pun, German roots. Salat means salad in German. As for "poke," well, take your pick of tales. Some say that it’s named for the sack, or “poke,” that was used to carry the plant in after it was picked. Others say that it’s named after the dimple in the berry that the plant produces that many say looks like it has been poked. Still others say that the word comes from the Algonquian Indian word “pakon” or “puccoon,” which they used to describe the dye derived from the plant, which they used for staining. And you will definitely get stained purple with poke salat! The festival is held the third weekend of May and includes food (including poke salat), a pet parade, music, arts and crafts, and more. 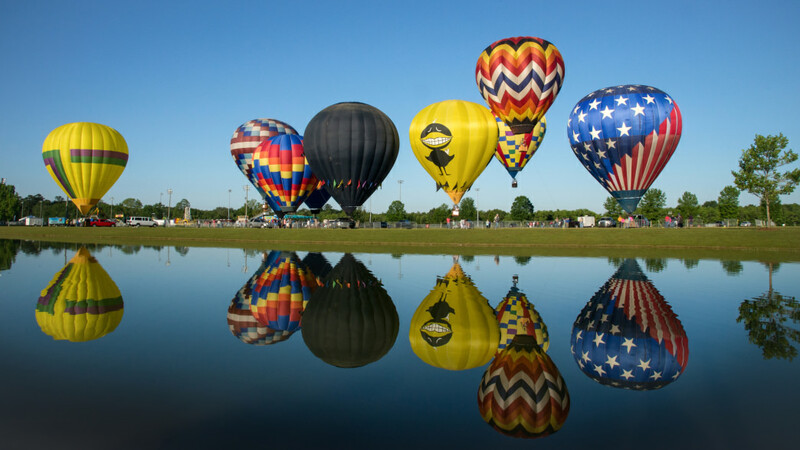 The city of Foley takes the concept of spring festivals to new heights, literally, with the Gulf Coast Hot Air Balloon Festival. 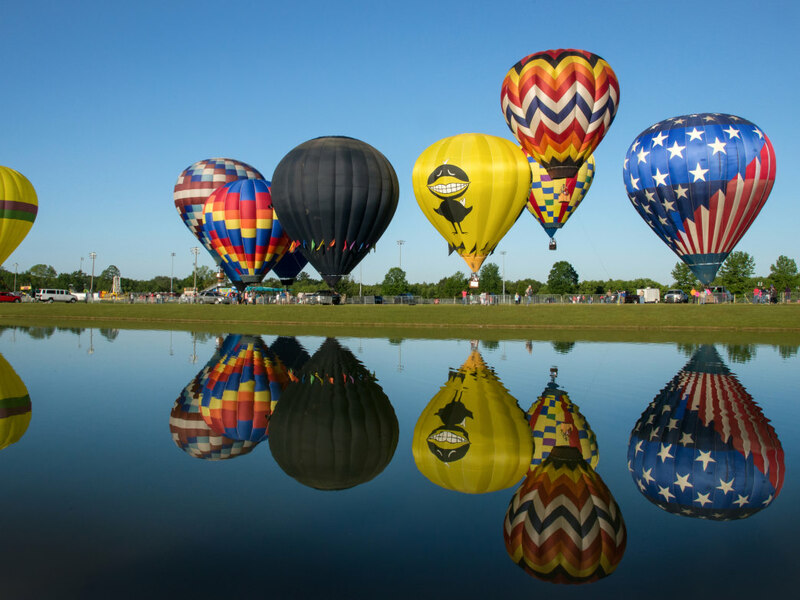 The event, now in its 14th year, is held the first weekend of May, bringing dozens of balloonists from around the country to the Alabama Gulf Coast. The festival begins on Friday as hundreds of people flock to a local outlet shopping center, the Tanger Center, to take in the warm glow of the balloons that are tethered to the ground and flaming up just after sunset. The things take off the following morning with the fly-in. Weather permitting, the sky is filled with balloons of every imaginable color combination as they silently sail into the Foley Soccer Park for a touchdown. Then, the booths open and the grounds become a good old fashioned spring fest with arts, crafts, music, and plenty of music. You can even take a tethered ride in one of the balloons.